The prospect of an old school, traditional effects driven horror movie excites me so much, I actually gave the Harbinger Down people money. Admittedly, this didn't sound like much of a gamble going in; it's not like this project is by a couple of newbies that have never made a movie before. Though writer/director Alec Gillis hasn't directed a lot of movies, he does have a long career as a special effects and make-up expert with a number of Oscar nominations to his name a couple of wins to his team at studioADI. These are the guys behind Aliens and Tremors and they're bringing their extensive experience and knowhow to Harbinger Down a movie that borrows unabashedly from both Alien and The Thing. The movie stars Lance Henriksen as Graff, the captain of a fishing vessel that happens to be carrying a group of grad students studying the effects of global warming on a pod of Orcas. Graff and his crew pull a body frozen in ice out of the Bearing Sea. The ice thaws and bad things happen. I'm not sure how many times I have to say this: never, EVER thaw anything you encounter but without the great thaw, there would be no movie and I'm OK with overlooking this ridiculousness for a load of pretty great looking practical effects and Henriksen being awesome. 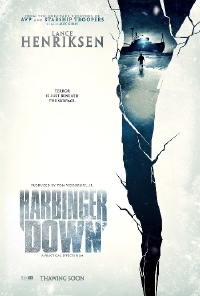 If you happen to be in San Diego during SDCC, there is a free screening of Harbinger Down on Saturday, July 11 (more details here). For the rest of us, the movie opens theatrically and on VOD August 7 and will be available on DVD September 1. Ok I'm a creature feature guy, so I might be a little bias. This looks pretty good. Ok who will cast the first stone.